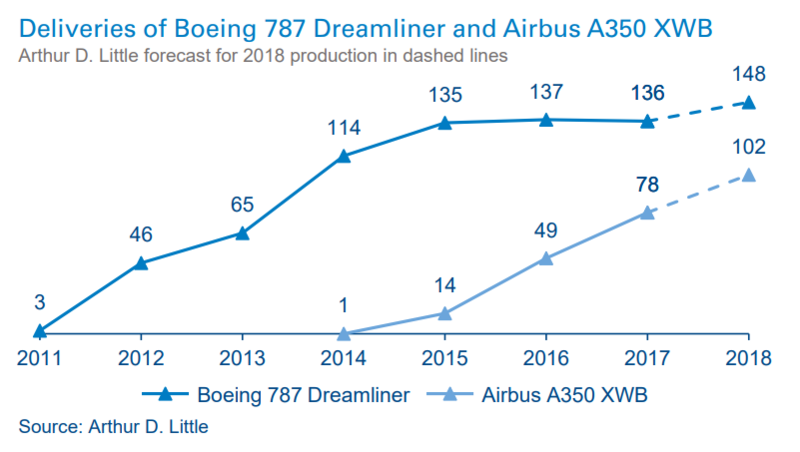 When the Boeing 787 Dreamliner and Airbus A350 XWB were developed almost a decade ago, they promised a new level of profitability for airlines and huge growth potential for the composites industry. Now that the early struggles are over, composite planes are taking to the skies. Today, the airspace composite components (ACC) market represents the largest demand for composites, even though supply chain struggles are still shaking the industry. Manufacturers are looking for the next growth area, and they may have found it: engines and interiors. Arthur D. Little has investigated current trends and challenges within the global ACC market. The airline industry has long been known for generating a low combined net income margin, at around 2–3 percent. When Boeing introduced the 787 Dreamliner at the beginning of the 21st century, it sold the idea of a profitable airline. The key selling proposition of this new composite long-range, wide-body aircraft was a lightweight structure that was made of more than 50 percent composites and offered 20 percent fuel savings over the 767. The second composite plane, Airbus A350 XWB, followed not long after, with a similar level of composite content and promises. 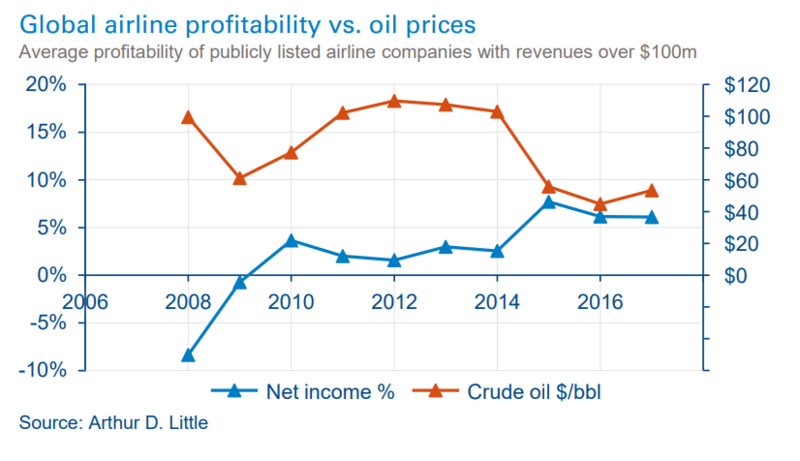 As observed from the chart below, profitability of airlines is strongly correlated with fuel costs, and OEMs bet the success of their composite planes on it. Ultimately, composite planes were a success and proved that going forward, the aerospace sector would be a key demand industry for lightweight materials. The aerospace market’s main differentiators from other composite component markets such as automotive are its maturity (composites have been used on aircraft since the 1960s), and resilience (due to steady demand, long-lasting programs and challenging qualification processes that secure the market share of well-established suppliers). Aerospace programs last more than 20 years once developed. For example, the 737 was first developed in 1967, and the 10,000th unit was rolled out of its Renton, Washington factory in March 2018. Securing a part in any program can provide a demand security for composite part makers that allows them to invest in their production capabilities. Another key consideration for the maturity of the market is the long, expensive and challenging qualification processes conducted by OEMs, industry organizations and accreditation agencies. These processes last several years, and both raw material suppliers and component manufacturers need to pass them to be able to sell their products. These processes also drive the cost of aerospace composite materials up to six times their industrial equivalents.